Update: Due to weather, the Career Expo scheduled for Jan. 29 will be rescheduled. The rescheduled date is Tuesday, Feb. 26 from 11 a.m.–1 p.m. in Smith Dining Hall. Bootcamp might make you think of push-ups or climbing walls, but Block 5’s bootcamp is all about helping Cornell students flex their career muscles. From Jan. 22 through Jan. 25, students can participate in the Berry Career Institute’s series of Career Bootcamp sessions over the lunch hour (11:30 a.m.–12:45 p.m.) where students will learn about resumes, internship and job-search skills, LinkedIn, and writing an effective personal statement and cover letter. The Career Expo is going to be bigger and better this year, featuring more than 20 partners. 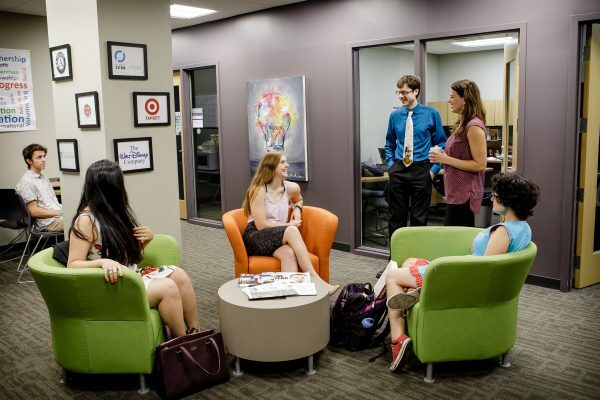 “The goal of the Career Expo is to demonstrate the strong talent Cornell College can provide to our partners and connect students to opportunities,” said Berry Career Institute’s Employer Relations & Career Coaching Director Jason Napoli. It’s not your traditional college fair, either. Instead of handing out resumes and participating in on-site interviews, this event is more informal, which the Berry Career Institute team says can lead to more connections as students find they’re more relaxed. There will be plenty of opportunities for students to network. Schafer says this is a great time of year for the expo because many employers are often thinking about upcoming openings and grad schools are accepting applications. Because every organization is different, though, Napoli encourages students to begin researching hiring practices or graduate school deadlines as soon as they know what they want to do. The Berry Career Institute team says if students are feeling anxious about the future, their best advice is to start career planning early by setting up an appointment with the Berry Career Institute to work with a career coach on their resume, search for internships or jobs, research and apply to graduate schools, and get connected to networking opportunities. Students of every major and year are welcome at the Career Expo, which takes place from 11 a.m.–1 p.m. on Tuesday, Jan. 29 in the Thomas Commons. If students can’t attend the event, employers will be tabling in the Thomas Commons lobby throughout the rest of the year. Seniors can also check out Cocktails & Career from 5 p.m.–7 p.m. during bootcamp week on Jan. 23 in Zamora’s, which is where students can connect with a career coach informally to get their career questions answered. Any questions can be directed to Rebecca Sullens at RSullens@CornellCollege.edu.